The wrecked Costa Concordia is being raised in one of the biggest maritime salvage operations in history. Workers are slowly lifting the vessel by pumping air into tanks attached to the ship. The refloating operation is expected to take six or seven days. The wreck will then be towed to its home port, Genoa, where it will be scrapped. The ship was hauled upright in September but is still partially submerged, resting on six steel platforms. “It’s a very complex operation,” Franco Gabrielli, the head of the civil protection agency overseeing the salvage, told reporters. Franco Gabrielli added that a search for the remains of Indian waiter Russel Rebello, whose body was not recovered from the wreck, would be carried out after the vessel was moved. 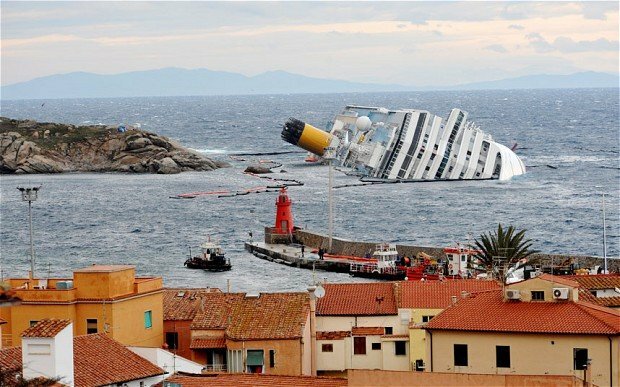 An engineer with Costa Crociere, the cruise operator, described the salvage efforts as “unprecedented”. Hundreds of divers and engineers have been involved in operations to salvage the Costa Concordia, which is twice the size of the Titanic. Local residents have said they are glad the wreckage will be removed. Costa Concordia’s captain, Francesco Schettino, is on trial for manslaughter and abandoning ship, charges he denies.